If it's a sign of the times, it's a sign of how truly backwards we are as a society when it comes to weight management. 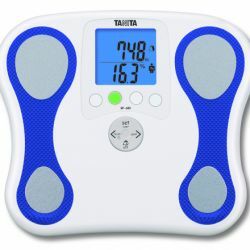 Scale company Tanita is now marketing a specially designed body-fat/weigh scale for children between the ages of 5-17. Now I've blogged before about how I think body-fat percentage scales are a bad idea to begin with, but to target them at children bring them to a whole new level of horror. 5 year olds don't need to have their body-fat or their weights measured, they need healthy food and parental role modeling. - Cook healthy meals from whole ingredients for each and every meal. - Have sit down family dinners each and every night (remembering they don't need to be gourmet - kids do love peanut butter sandwiches). - Involve your children in meal (and school lunch) preparation. - Track the added sugars in your childrens' diets and try to limit to no more than 45 grams daily (remembering that some days should be exceptions too - sugar's part of childhood, it just needn't be a daily part). - Ensure that the only fruit they eat is actual fruit - no juices, rollups, chews, or mashes. - Make their milk white and skim, not brown and sugary. - Ensure your children eat protein with every meal and snack, and that they start their days off with a wholesome, protein inclusive, breakfast. - Make restaurant meals and take out (including supermarket prepared takeout meals) exceedingly rare events. - Engage your family in family based physical activity - weekend hikes, nightly walks, signing up for community races, landscaping, home improvement projects, push lawnmowers, snow shoveling, etc. Lastly you've got to remember - if you're worried about your kid's weights, don't put it on them. It's not their problem, it's yours, and if you think you're going to fix it by yelling at them, weighing them, shaming them, food policing them, etc. - you're going to be disappointed, and your kid is going to be miserable. If you want your kids to change the way they're living, you're going to have to change the way your whole family's living - and frankly it isn't about weight. All of those behaviours up above? Doesn't matter if your kids are heavy or thin, those strategies will benefit each and every family, though the likelihood is, if weight's an issue in your family, those changes will help far more than any scale ever could.